Stroke is a leading cause of mortality and morbidity worldwide. In the UK stroke is the third most common cause of death and the main cause of acquired disability. Approximately 130,000 individuals experience a first ever stroke per annum. In addition to widely applicable pharmacological treatment for acute stroke, effective prevention and rehabilitation strategies are crucial. The development of such strategies is a major challenge for the 21st century medicine. Exercise and physical activity have an increasing evidence base in the primary and secondary prevention of stroke and in stroke rehabilitation. The interface between physical activity and cerebrovascular disease is complex and of broad interest to clinicians, therapists, and epidemiologists. The importance of the relationship is becoming clearer: physical inactivity has been implicated by the INTERSTROKE study as one of the 5 key risk factors which account for more than 80% of the global burden of stroke. Physical fitness training is increasingly being recommended as a component of stroke rehabilitation programmes due to the emerging body of evidence surrounding the benefits in improving the function after stroke. The role of long-term physical activity in patients who have had a stroke in the prevention of further stroke is less clear. A general reduction in aerobic fitness has been recorded following Stroke. It is a condition which often leads to reduction in mobility and therefore secondary deconditioning. An increasing body of evidence is mounting which demonstrates the efficacy of specific cardiorespiratory training in this population. In the past, physiotherapists often avoided indluding high-intensity exercise as part of stroke rehabilitation, believing that it was detrimental to performance of motor tasks; there is now a body of evidence which clearly shows this belief to be completely unfounded. A number of studies have shown that high-intensity exercise has no detrimental effect on spasticity. A study in which a small group of long term (more than 9 months) ambulant stroke patients concluded: "The 10-week combined program of muscle strengthening and physical conditioning resulted in gains in all measures of impairment and disability. These gains were not associated with measurable changes of spasticity in either quadriceps or ankle plantarflexors." A 2004 review of RCTs shows strong evidence for using high-intensity strengthening exercises of the lower paretic limb following stroke. Low-level walking, self-care activities, intermittent sitting or standing, seated activities, range of motion activities, motor challenges. At intensities that are ~ 10-20 beats/min increases in resting heart rate; rating of perceived exertion ≤11 (6-20 scale); frequency and duration as tolerated, using an interval or work: rest approach. Such activities are aimed at preventing deconditioning, hypostatic pneumonia, orthostatic intolerance, depression, and stimulating balance and coordination. 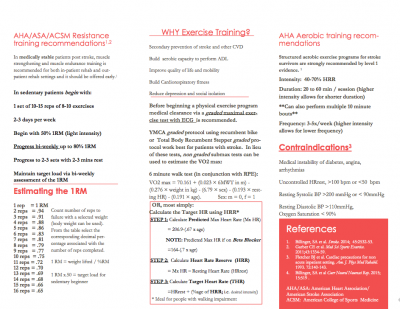 Aerobic exercises that include large-muscle activities (e.g., walking, graded walking, stationary cycle ergometry, arm ergometry, arm-leg ergometry, functional activities seated exercises) if appropriate. At intensities that are ~40-70% oxygen uptake reserve or heart rate reserve; 55-80% heart rate max; rating of perceived exertion 11-14 (6-20 scale), for 3-5 days/week, 20-60 min/session (or multiple 10-min sessions), that includes a 5-10 min of warm-up and cool-down activities. Such activities are aimed at increasing walking speed and efficiency, improving exercise tolerance (functional capacity), increasing independence in activities of daily living, reducing motor impairment and improving cognition, and improving vascular health and inducing other cardio-protective benefits. Muscular Strength/Endurance activities include resistance training of upper and lower extremities, trunk using free weights, weight-bearing or partial weight-bearing activities, elastic bands, spring coils, pulleys, circuit training, and functional mobility. At intensities that correspond to 1 to 3 sets of 10-15 repetitions of 8-10 exercises involving the major muscle groups at 50-80% of 1 repetition max, for 2-3 days/week, with gradually increasing resistance over time as tolerance permits. Such activities are aimed at increasing muscle strength and endurance, increasing ability to perform leisure-time and occupational activities and activities of daily living, and reducing cardiac demands during lifting or carrying objects by increasing muscular strength. Flexibility should also be a focus that involves static stretching of the trunk and upper- and lower extremities. Holding each stretch for 10-30 seconds, with the stretches performed 2-3 days/week (before or after aerobic or strength training). These activities increase range of motion of involved segments, help to prevent contractures, decrease risk of injury, and increase activities of daily living. Neuromuscular activities such as balance and coordination activities, Tai Chi, Yoga, recreational activities (paddles/sport balls to challenge hand-eye coordination), and active-play video gaming and interactive computer games. Employ 2-3 days/week as a complement to aerobic, muscular strength/endurance training, and stretching activities. These activities improve balance, skill reacquisition, quality of life, and mobility; decrease fear of falling; and improve level of safety during activities of daily living. Mr. John Woloski endured a complex CVA and was referred to Allied Services Heinz Rehabilitation Hospital's Brain Injury Rehabilitation Unit. Maybe it was his love of music after decades of teaching music education in Wilkes-Barre, Pennsylvania, then Principal of Solomon/Plains Junior High School? Maybe it was his positive outlook and commitment to physical rehabilitation? Rehabilitation can and should have an element of fun. 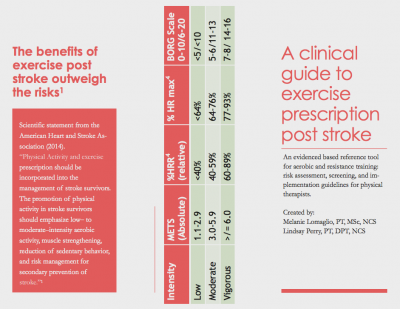 Clinical Guide to Exercise Presecription Post Stroke from the American Physical Therapy Association. It is estimated that 610 000 first strokes occur in the United States each year. Worldwide, it is estimated that there were 11.6 million incident ischemic strokes and 5.3 million incident hemorrhagic strokes in 2010. Although transient ischemic attacks can precede stroke, most strokes occur without warning. Stroke is a preventable disease, and control of modifiable risk factors plays the major role in prevention strategies. There is substantial, consistent evidence from numerous, high quality studies that higher PA levels are associated with significantly lower risk of stroke, and this evidence suggests that PA has a protective benefit in stroke prevention beyond the traditional stroke risk factors. With the high prevalence of physical inactivity in the general population, increasing PA levels could have a significant effect on reducing stroke incidence. The Copenhagen Stroke Study reported that 22% of stroke survivors are unable to walk at the end of rehabilitation programmes . Independent gait is closely related to independence and achievement of activities of daily living and, therefore, is one of the aims of physical training after stroke. A systematic review investigating the effectiveness of lower-limb strengthening, cardiorespiratory or gait-oriented tasks in improving gait, gait-related activities, and health-related quality of life in stroke survivors evaluated 21 randomised controlled trials. The evidence generated supports the conclusion that gait-oriented training improves walking competency after stroke but has no significant effect on activities of daily living or health-related quality of life . A previously mentioned review examined the effects of cardiorespiratory with strength training, high-intensity physiotherapy, and repetitive task training on gait and found that only cardiorespiratory training is supported by strong evidence of beneficial effects on walking ability. Given the numerous health benefits of PA, there are many public health guidelines on the recommended volume and intensity of PA for optimal health. Although separate guidelines for stroke prevention do not exist, the recommendations for primary stroke prevention are consistent with the current US guidelines: at least 40 minutes/d of moderate to vigorous intensity aerobic PA 3 to 4 days/wk. These recommendations should be stressed as part of an overall stroke prevention strategy, but even more so in persons with other risk factors. The literature suggests that men achieve a greater reduction in stroke risk when they engage in PA at a moderate to vigorous intensity, whereas women benefit from greater amounts of low intensity PA, such as walking. Further research is needed to clarify the type and intensity of PA, potential differences by race/ethnic groups, and use of more objective measurement of PA to clarify the dose–response relationship in men and women. The recommended PA level for stroke prevention is associated with a low risk within the general population, with an acceptable risk:benefit ratio. So to use the common motivational phraseology, just do it. And do it every day! Low physical activity is associated with reduced mobility, walking ability (6 minute walk test), aerobic fitness (VO2 peak), reduced balance, and depression but not with age or other demographic variables. Establishing direction of causality in these associations is impossible with the available cross-sectional data; stroke impairments may directly lead to reduced activity levels, and reduced activity may lead to further reductions in fitness levels and thus mobility .Similarly, low mood could be both cause and consequence of low physical activity, and depression/low mood could negatively affect self-efficacy, motivation, and self-determination which determine the uptake and maintenance of physical activity after stroke. ↑ Scottish Intercollegiate Guidelines Network (SIGN), [http://www.sign.ac.uk/guidelines/fulltext/108/ Management of Patients with Stroke or TIA: assessment, Investigation, Immediate Management and Secondary Preventio. SIGN 108, A National Clinical Guideline, Edinburgh, UK, 2008. ↑ Gallanagh S, Quinn TJ, Alexander J, Walters MR. 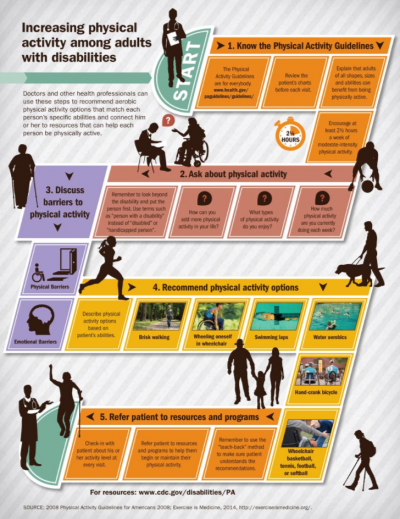 Physical activity in the prevention and treatment of stroke. ISRN neurology. 2011 Oct 1;2011. 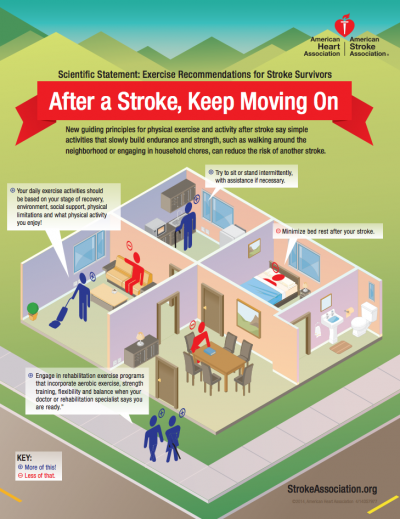 ↑ Billinger SA, Arena R, Bernhardt J, Eng JJ, Franklin BA, Johnson CM, MacKay-Lyons M, Macko RF, Mead GE, Roth EJ, Shaughnessy M. [http://stroke.ahajournals.org/content/45/8/2532 Physical activity and exercise recommendations for stroke survivor. Stroke. 2014 Aug 1;45(8):2532-53. ↑ Kelly JO1, Kilbreath SL, Davis GM et al. Cardiorespiratory fitness and walking ability in subacute stroke patients. Arch Phys Med Rehabil. 2003 Dec;84(12):1780-5. ↑ Bateman A1, Culpan FJ, Pickering AD et al. The effect of aerobic training on rehabilitation outcomes after recent severe brain injury: a randomized controlled evaluation. Arch Phys Med Rehabil. 2001 Feb;82(2):174-82. ↑ Care, S. R., & Brown, J. (2008). CONCISE GUIDANCE TO GOOD PRACTICE A series of evidence-based guidelines for clinical management Long-term neurological conditions : management at the interface between neurology , rehabilitation and palliative care, (10). ↑ Sharp SA1, Brouwer BJ. Isokinetic strength training of the hemiparetic knee: effects on function and spasticity. Arch Phys Med Rehabil. 1997 Nov;78(11):1231-6.